This week, an element whose existence had been expected, Here's David Linsay. 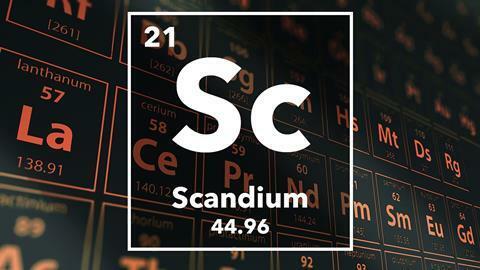 Scandium, atomic number 21. It is the first of the transition metals, and its discovery is entwined with that of vertical neighbours yttrium and lanthanum. The Swedish island of Resarö, near Stockholm, became a hotbed of elemental discovery in the late eighteenth, and early nineteenth, centuries. 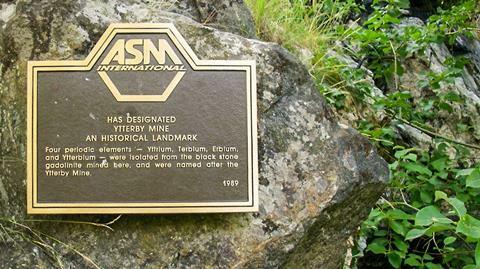 A quarry near the village of Ytterby yielded two different mineral ores, from which the seventeen so-called rare earth elements were eventually identified, those being scandium, yttrium and the fifteen lanthanide elements. In 1788, a Lieutenant Arrhenius found an unusual black rock near the town of Ytterby. He passed this on to the famous Finnish scientist Johan Gadolin, and the story of the discovery of the rare earths began. In 1879, Lars Nilson isolated the oxide of a new metal element from the minerals gadolinite and euxenite. Nilson was a student of the legendary Jacob Berzelius, himself discoverer of many elements. Nilson named this oxide scandia, after Scandinavia. 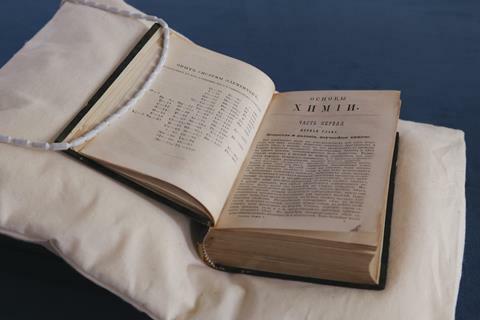 The discovery of this element was especially notable, as, seven years previously, Mendeleev had used his periodic table to predict the existence of ten as yet unknown elements, and for four of these, he predicted in great detail the properties they should have. One of these four, Mendeleev predicted, should have properties very similar to boron, and he named this element 'ekaboron', meaning 'like boron'. 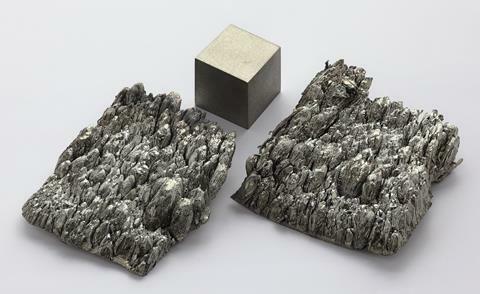 The metal of this new oxide, scandia, was indeed found to have similar properties to this ekaboron, thus demonstrating the power of Mendeleev's construction. For example, Mendeleev predicted the element's molecular weight would be 44 and that it would form one oxide with formula Eb2O3; scandium has molecular weight 45, and forms scandium oxide, Sc2O3. Some of Mendeleev's predictions were even more detailed. He predicted that the carbonate of ekaboron would not be soluble in water, which scandium carbonate is not. He even made a prediction related to the discovery of the element – that it would not be discovered spectroscopically. Indeed, scandium produces no spectroscopic lines, so could not be identified by this method of analysis. However, it was another Swedish chemist, Per Theodor Cleve, who was also working on the rare earths, who noticed the similarity between Nilson's new element, and the ekaboron predicted by Mendeleev. Despite the discovery of the oxide of this new element, it would take almost another sixty years until pure, elemental scandium was prepared, being made by electrolysis of scandium chloride in the presence of lithium and potassium, at high temperature. Scandium is the first of the transition metals. Many of the transition metals exhibit a very rich and varied chemistry, due to the fact that they can exist in a wide variety of oxidation states. Scandium, however, is limited to the plus three oxidation state, meaning its chemistry is not quite as diverse as some of its transition metal counterparts. Scandium is very much a late starter compared to many of the other elements, due to its relatively low occurrence and the difficulty in obtaining it from its ores. For example, it wasn't until the 1960s when the first pound, or 450 grams, of high purity scandium was obtained. 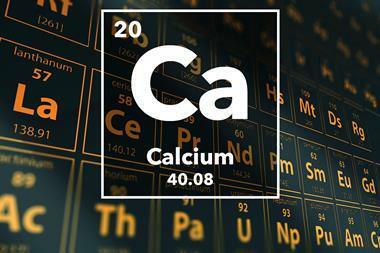 Compounds of scandium find use in organic chemistry. Like many of the lanthanides, the trifluoromethansulfonate, or triflate, of scandium finds use as a so-called Lewis acid, accepting a pair of electrons from a suitable organic molecule, and activating the organic molecule to take part in highly efficient and selective chemical reactions. Scandium is also the source of artificial natural light. This might sound like a contradiction, but when scandium iodide is added in very small amounts to mercury vapour lamps, it produces light that is very similar to natural sunlight, and these lamps are used for applications ranging from floodlights to film projectors. 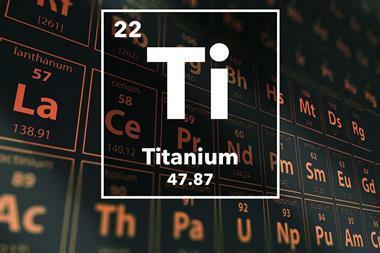 Scandium is added in small amounts to aluminium, to produce an alloy which is very light, yet very strong. As such, it has found use as a material for high performance road and mountain bikes. 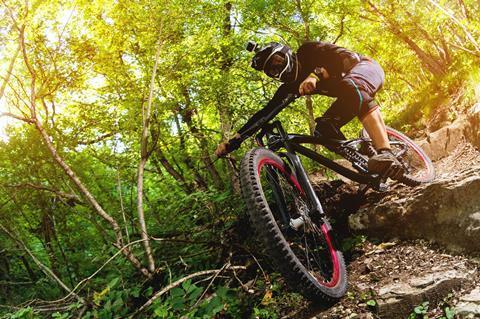 The advent of new frame materials, such as carbon fibre and titanium, has somewhat lessened the popularity of scandium alloy bike frames, but many such frames are still being made today. So, that's scandium – the element first found in the late eighteenth century, and not isolated pure and in large quantities until the middle of the twentieth century. One which helped demonstrate the power of the periodic table, and which you'll find illuminating football fields, and in the frames of mountain bikes. And bringing us into the light there, was Reading University's David Lindsay, with the bright, strong chemistry of scandium. Now next week an element providing one more punch in the fight to protect our environment. As everyone knows chlorofluorocarbons, CFCs for short, have been widely used in the past for fridges and freezers as the refridgerant gas. CFCs contribute to both depleting the ozone layer and they are also greenhouse gases. Due to this their use in the developed world has largely ceased, meaning a good, environmentally friendly replacement is needed. Gadolinium may prove useful to the fridges of the future due to a process known as magnetic refridgeration or adiabatic demagnetisation. And join Uppingham School's Simon Cotton, to find out how magnetic refridgeration using the ions of gadolinium will be keeping our food cool in the future, in next week's chemistry in its element. Until then, I'm Meera Senthilingam and thank you for listening.